Information Minister Hasanul Haq Inu said on Wednesday that the chief justice was not a child nor was Khaleda Zia lily-white. 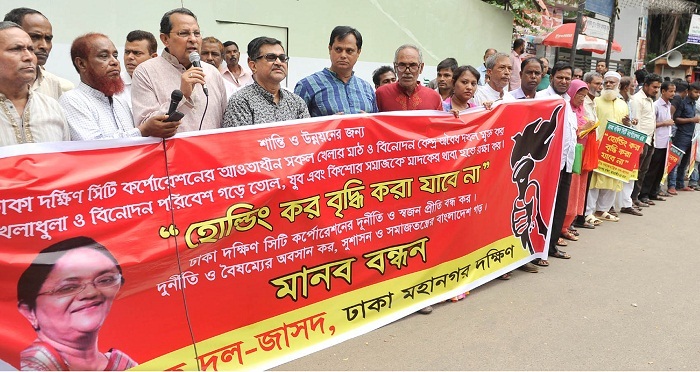 The minister was speaking at a rally in front of the National Press Club organised by the Jatiya Samajtantrik Dal (JSD). Inu said that the position of chief justice was a constitutional one and by making remarks suggesting that the executive had coerced him Khaleda and her party were undermining him and the institution. "It is not fair nor is it constitutional," he said. He reminded the non-parliamentary opposition not to make such irresponsible remarks. "The chief justice is not accountable to the executive. He sanctions his own leave," he reminded those who were suggesting otherwise. Inu also said that Khaleda Zia was not respectful towards the law. If she had been so she would have followed the legal directives. The party arranged the illegal occupation of playfields in the city corporations and increase in municipal tax rates. City JASHOD leaders also spoke at the meeting.